It's your "paper anniversary" and here's a perfect traditional anniversary gift for your husband or wife. 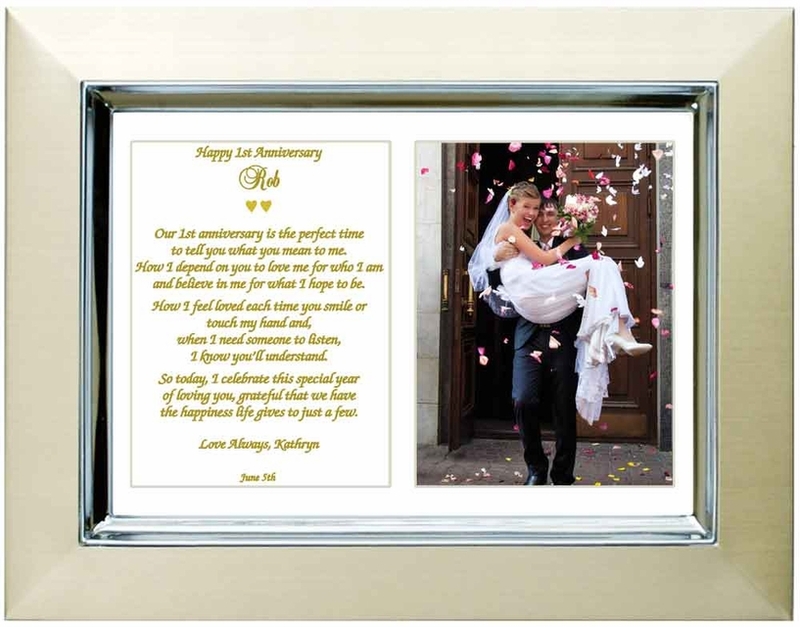 A love poem printed in gold colored lettering to go with the 5x7 inch gold metallic frame. Let this sincere wish, personalized with names, date and photo show how much you love him or her on your first anniversary. The first anniversary is a milestone in the life of the newlywed couple. Commemorate this occasion with a keepsake for your husband or wife. This love poem and photo frame is a wonderful way to let your spouse know how much you love him or her. the happiness life gives to just a few. The cut-out photo opening in the white mat is for a 3 x 4 inch photo or part of any larger size photo. Great gift idea for our paper anniversary..thanks!